F.l.t.r. : Rev. Stephen Pedro (Scribe), Rev. Quentin Minnaar, Br Mkhululi Menziwa (Men’s Ministry), Sharné Parker (Admin), Rev. Moses Baartman (Chairperson), Rozetta Willemse (Admin – CVB), Rev. Xolani Mhobo, Rev. Peter September (Youth Brigade), Sr Lynette Roelfse (CVB) and Rev. Karien Muller. 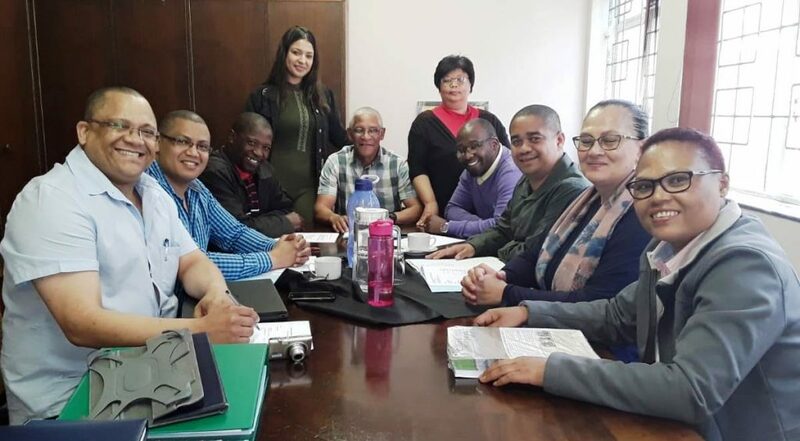 On 29 to 30 October the SMCM (Synodical Ministry for Congregational Ministry) had their second meeting in Belhar after the Cape Synod in July 2018. It was indeed a blessed meeting and they have discussed urgent issues, attended to important synodical decisions, etc. Under the guidance of the new leadership, Rev. Moses Baartman (Chairperson), Rev. Daniel Bock (Vice-chairperson) and Rev. Stephen Pedro the Minister in Synodical Service (Scribe) as the Executive, the Team has started a mission to give the congregations of URCSA Cape it’s rightful place within the broader Ministry of URCSA Cape. We decided to attend to the restructuring process after Synod accepted the termination of the SCE (Synodical Commission for Education). A few decisions relating to the restructuring have been taken and as soon as the Synodical Commission accepted it, we will start with the implementation phase. Our MSS, Rev. Pedro, initiated and explore the possibility that we work more closely and in coordination with the other Core and Support ministries to be more effective and prevent duplication, especially where there is overlapping of tasks and services to our congregations. The URCSA’s MSS (Ministers in Synodical Service) planned to meet again on 8 November 2018 to take this initiative further and planned to meet on a monthly basis. These and other important issues relating to the ministry of our congregations will soon be send as a circular to our congregations. So please, watch this space!